Posted 4:20 pm by Roberta Mittman & filed under Healthy Eating. Let’s slap down a very widespread misconception with a big dose of truth today. Here goes: “Eating fat” and “getting fat” are two completely different things. When we talk about dietary fat, we mean a whole collection of substances. Some of these fats are harmful and best avoided, but many other fats have healthful characteristics. The molecules in these “healthy fats” work easily with your digestive, muscular, immune, and other systems that use those nutrients to energize, repair, and support the whole body. When people talk about “getting fat,” on the other hand, they mean putting on weight—that is, the expansion of the body’s fat cells—which, frankly, no one likes very much. But these two ideas are quite separate. Repeat after me: Eating healthy fats does NOT make YOU fat. In fact, plenty of evidence shows that the reverse is true. The human body readily recognizes healthy fats as fuel, and so they trigger a sense of satisfied fullness. Eat an appropriate amount of healthy fat, and you no longer feel hungry. That’s why “fat-free” and “low-fat” diet plans so often fail. A person whose plate doesn’t contain enough fats never quite feels full—and that, in turn, leads to cravings and overeating. Fat-free also is questionable because fats make food taste good and give it texture. But take all the fat out of a food, and much of the sensory pleasure of eating goes away, too. Manufacturers who package “low fat” foods often add sugar or salt to make the food appealing again—and with those additives comes inflammation, bloating, weight gain, and other unpleasant effects. Bottom line: Don’t avoid fat altogether. Instead, learn to recognize and incorporate more of the right fats—the healthy fats. All sound nutrition plans draw on healthy fats, from the Mediterranean diet to the now-trending keto diet. And modern studies show that they don’t make you fat or raise your cholesterol, as we were once taught. Many sources of fat are available to us. The trick is knowing which fat is best suited to what purpose, and how much of that fat is ideal to create a good balance. Here are three different types of healthy fat to consider including on your own plate. With their high relative protein and omega fat content, nuts make a good snack, or a nice crunchy topping or mix-in with another dish. Delish! Just be cautious about portion size. 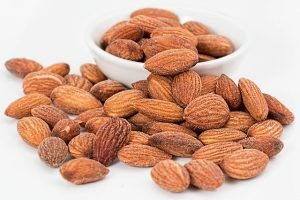 Nuts of all kinds pack very concentrated fats of several types, some desirable and some…not so much. Also, most nuts have much more omega-6 than omega-3, an imbalance that Western diets already struggle with. So by all means, enjoy nuts, whether you choose almond, macadamia, pecan, or otherwise. Just limit your serving to no more than a small handful. Olive oil is a fantastic healthy fat choice for preparing many dishes. It’s a good choice to use in cooking because of its light flavor and texture, and it’s readily available in any food market. 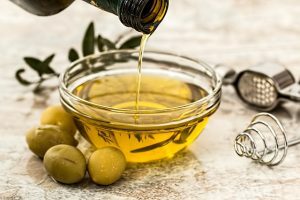 Olive oil is also naturally full of antioxidants, those molecules that have long been noted for their ability to capture and prevent DNA damage. Not all olive oils are equal—read labels carefully before you cook. Look for 100 percent pure olive oil, not the kind that’s cut with other vegetable oils. (Hint: If it’s unusually cheap, that’s a quality and purity red flag.) Also, regular cold-pressed olive oil is a good choice for stovetop cooking, but extra-virgin cold-pressed changes form at high heat. EVOO is best reserved for cold applications, like blending into a smoothie. Olive oil has wellness uses outside your kitchen, too. If you use tea tree, lavender, or any other essential oils for skin care, olive oil makes a very good neutral carrier or base oil. As a healthy fat, coconut oil stands in a category all its own! The fats extracted from this tropical fruit (it’s not a nut, despite its name) are associated with numerous nutritional and wellness benefits. Virgin, raw, cold-pressed coconut oil, with its distinct fragrance, makes a wonderfully relaxing natural skin moisturizer. Like olive oil, coconut oil is also a good choice as a carrier oil for other essential extracts. Coconut makes a good choice for some kinds of cooking, too. For grilling or pan cooking with direct heat, coconut oil works even better than olive oil because it has a higher smoke point—that is, it can sustain a higher temperature before burning. And because pure coconut oil remains solid at temperatures below 76 degrees, it can even stand in as a substitute for lard or (ick) margarine to replicate your grandmother’s classic cookie recipe, modern style. While those baked goods are certainly “in moderation” foods, coconut oil is a very healthful part of more ordinary daily cooking. That’s because around 60 percent of the fat found in coconut oil is of one specific molecular structure known as medium-chain triglyceride, or MCT for short. MCTs are high on the list of healthy fats. Unlike some other fats, medium-chain fats are very easy for the human body to digest quickly while helping the system absorb nutrients from food. MCTs also help to support good microbes in the gut while targeting harmful ones. These fats that are used efficiently and immediately don’t get stored away in the body’s cells for later, either, and in fact can increase a person’s rate of metabolism. Yes, you read that right: MCTs are dietary fats that help you burn body fat! For most of us, weight management is a huge plus. But evidence also exists that a diet rich in MCTs is linked to lower inflammation, decreased risk of heart disease, and better brain function. Sign me up! Don’t like coconut? No problem. MCTs are also found in lower concentration in butter from grass-fed cows, certain types of palm oil, whole-milk yogurts and cheeses, and grass-fed beef. Or just go straight for the good fats by looking for MCT oil by that name. 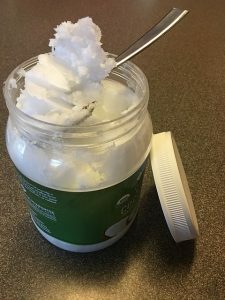 This purified concentrate of the MCTs found in raw coconut oil (but without the fragrance or flavor) is readily available in your favorite nutrition shop or even the supplement section of some grocery stores. MCT oil is liquid and light, making it a flexible choice. My favorite use: salad dressing! The time has come to erase the outdated idea that “fat” is a bad word. A well-rounded diet needs fat—it’s just a matter of choosing the right ones. The list above is a starting point. Where will you go next in your quest for greater wellness? Explore, experiment, or reach out to me for ideas on getting the most out of these and other beneficial fats. The path to more satisfying meals, sharper thinking, less painful movement, and truly energized, vital living just might begin at your plate!